Some suggestions for the best ways to document your travels: these are creative ways to document your trips, keep memories vivid and engage others while you do. When you are travelling the world, it can be easy to get lost in the moment. However, you want these memories to last a lifetime, and so it is vital to document your travels so that you can look back over them when you are older. Read on to discover the many different fun suggestions you can use. Most of my itineraries start off as to-do lists that are maintained in the notes section across all devices. I love that you can access these even when offline and cross them off as you finish doing them. It also allows you to add other offbeat things you actually ended up doing. Great ready-reckoner! Perhaps not so practical whilst travelling, but creating a paper scrapbook when you return home will give you time to really reflect on your experience in another way. I love collecting entry tickets, paper coasters, stamps, currency etc. and sticking them in my scrapbook. 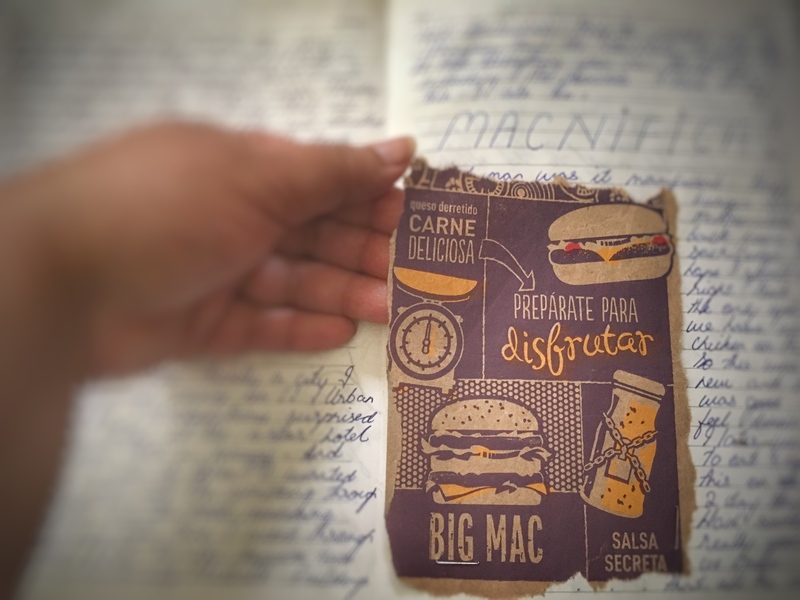 Here’s a sneak peek at a page from my scrapbook while travelling through South America. It contains a piece of my McDonald’s paper bag to remind me of my first ever beef burger. The Magnifica! Ps: McDonald’s in India only serves chicken on the menu. I take pictures of everything I do, eat and see while travelling because my days are often packed with a frenzy of activities and I’d hate to forget some tiny detail in the process. I like ending my travels by going through my images to relive and reminisce how beautiful it was. My shares usually end up on my Instagram page. If writing and photography aren’t your thing, video recording stands as a fantastic alternative. No fancy equipment needed – the video camera on your phone will do the trick and you can use simple, free programs like iMovie or Windows Movie Maker for basic editing. YouTube is the most popular platform for posting and building your audience. You can read more about how “Online video is the future of travel content” and here’s a video of my Journey to The Great Rann of Kutch. Platforms that allow storyboards work as a great visual asset. Initially, I used storified.com which is now discontinued. So I’ve now moved onto using Pinterest which seems to have boosted my shares and helped increase my blog visibility. 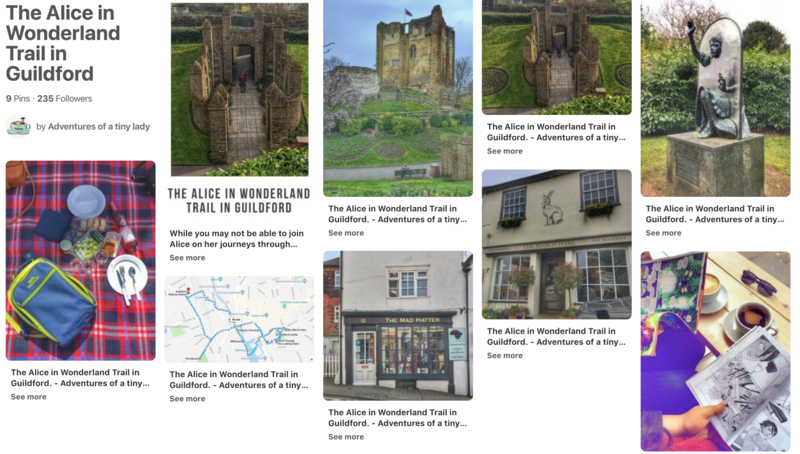 Here is a visual representation of my Alice in Wonderland Trail in Guildford. 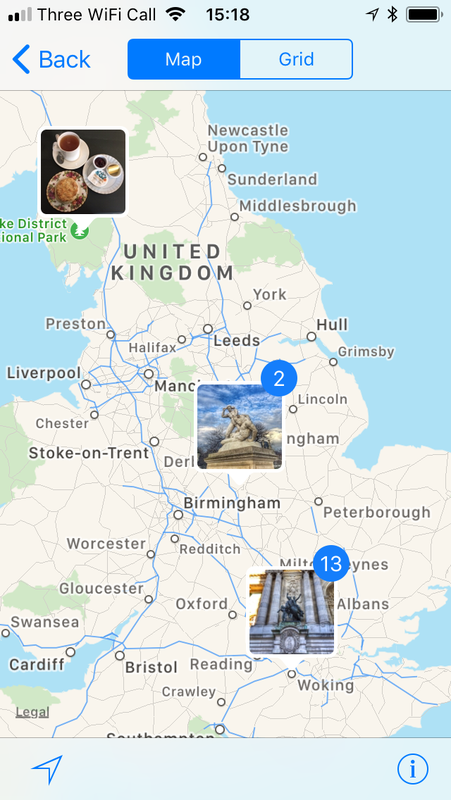 One of the cool things that your iPhone can do is tag your photos with geolocations. That way, you’ll know where you took the photo in addition to having the photo. This really helps with long trips like when you’re backpacking across Europe. Google lets you save places you’ve been to, which form a lovely visual display of been there, done that map! I love sending postcards when I travel, but what I love even more is sending personalised postcards. Did you know that you can print a 4X6 picture you took, turn it over, write an address, stick a stamp on it and actually send it by post? It’s a great way to share your fond memories with the people you love. I believe that writing backed with photos and videos is the most comprehensive way of expressing what you did on your travels. If you intend on starting a blog right now, this should help The Ultimate Travel Blogging Resource List. If lengthy writing isn’t your thing, consider microblogging, a combination of blogging and instant messaging that allows users to create short messages to be posted and shared with an audience online. Instagram and Tumblr are great platforms to kickstart this. 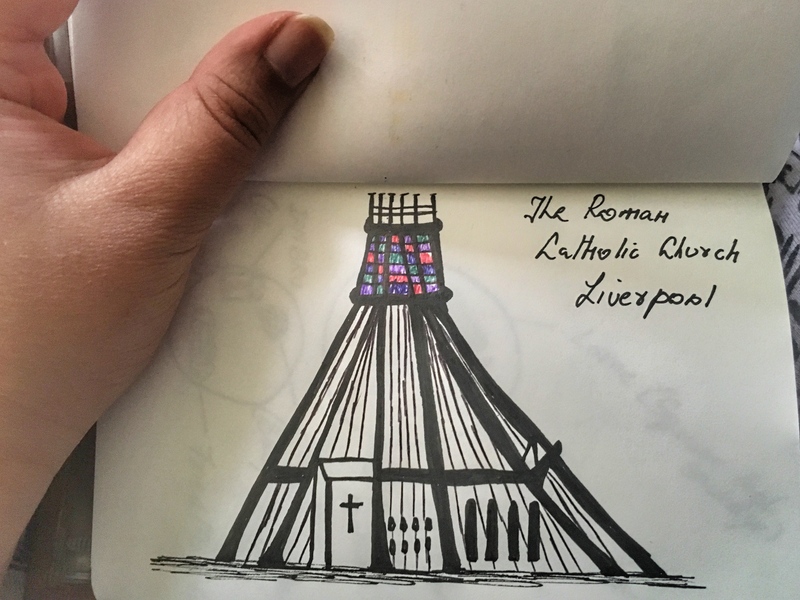 Journals let you scribble, doodle, and illustrate in a more fun and personal way. Because sometimes a picture is worth a thousand words, and it works out perfectly if you decide to rest your tired feet to sip on some coffee. Scribble away, my friend! The single-fold leather cover features black elastic bands to hold two notebooks on the inside. One for writing and one for sketching. Once you complete each journal you can just replace them with new ones within the cover. The journal is an all-rounder and can hold a pen, passport, ticket stubs, receipts, money etc. While the leather is ethically sourced, nothing goes to waste. Scraps are used to make other products that The Black Canvas sells, like keychains etc.And since leather is long-lasting and sturdy this diary can quite literally age with you without adding to the growing waste pollution. All craftsmanship is locally employed in Mumbai, India and the paper used in the notebooks are 100% eco-friendly. It comes personalised with “Adventures of a tiny lady” and “Carpe Diem”, my favourite phrase. ← Alice in wonderland trail in Guildford. Fab ways to document a trip here. I always take and share as many photos as possible. I do videos too. I make scrapbooks all the time – hence the name of my blog Scrapbook Adventures – they are now just often online instead! Some lovely ideas here! 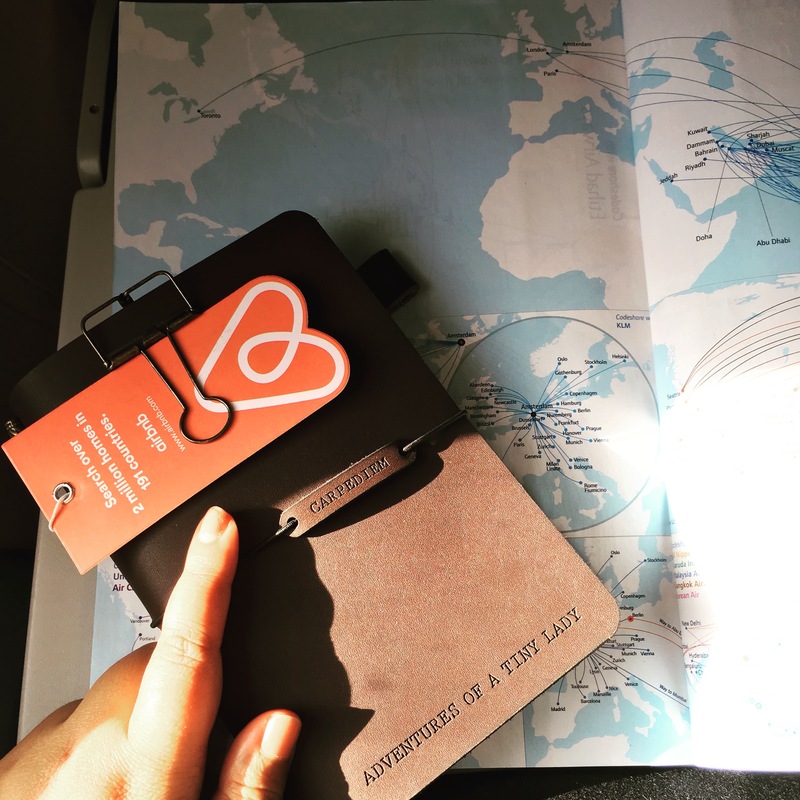 What a great way to document your trip and have all of your memories all there to look back on!